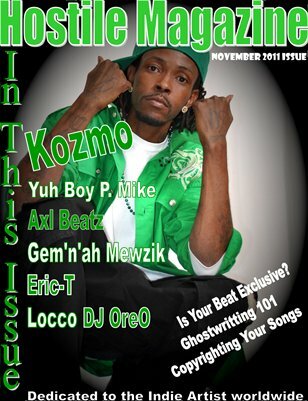 November issue of Hostile Magazine features artists Yuh Boy P. Mikes, Kozmo, DJ OreO, Eric T, Axel Beatz, Locco, and Gem'n'ah Muzik. Hostile Magazine is dedicated to the indie artist world wide. For features in the magazine, send an email to solarentmg@gmail.com for information.